If you're looking for quality car servicing in Market Deeping or anywhere in the surrounding areas, call the professionals here at D W Needham Motor Engineer Ltd. With over 30 years within the auto trade, you can count on us to fulfil all of your vehicle requirements at an exceptional rate. Whether you're looking for car servicing, an MOT test or some new tyres in the Deeping's, we are the company to call. All of our work is completed by qualified motor engineers and no matter how large or small the job may be, you can always count on us to complete it to the highest of standards. We can provide a vehicle recovery service throughout the local area if needed and courtesy cars can be made available upon request should your vehicle be off of the road for too long. We can cater for most makes and models of vehicle and we can provide an annual service and MOT test available from just £138 all inclusive. 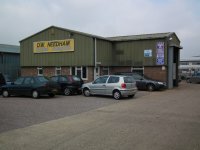 So, for car repairs in the Deeping's and beyond; call D W Needham Motor Engineer Ltd today. You can reach us through our contact page, or by calling 01778 347694. When you need car servicing in Market Deeping, don't hesitate to give us a call!